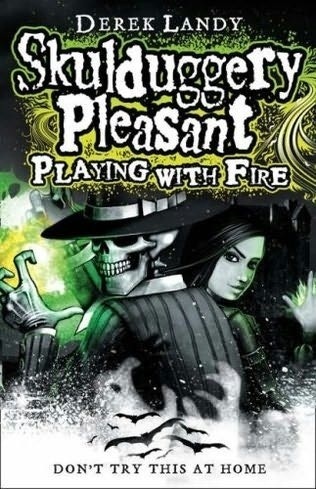 Reading this immediately after the first in the series, Skulduggery Pleasant, is interesting: it highlights both some flaws and some developments. In terms of plot, there’s a sense of déjà vu from the first book: a general from the previous war escapes from prison; he sets about acquiring an artefact to bring back ancient Gods, the Faceless Ones; he is defeated on the cusp of success. The baddie this time is Baron Vengeous (again letting us see Landy’s almost Dickensian playfulness with his characters’ names – although BBC Radio 4’s Dickensian spoof Bleak Expectations’ still wins the name calling contest for me, naming its antagonist Mr Gently Benevolent!) And the artefact in question is The Grotesquery: a dead Frankenstein hybrid of various parts of various monsters including the corpse of a Faceless One. There is a ramp up in the violence and gore here from the first book: the Grotesquery itself is a combination of gory detail and bandage-covered suggestion of worse; numerous characters get ripped apart and poisoned and crushed. A note on Landy’s magic system. Sorcerers come in two categories: Elementals who manipulate earth, fire, water and air; and Adepts who can do anything else. China Sorrows’ body is (presumably magically) covered in multiple rune and symbol tattoos which can be activated to create effects; Billy-Ray Sanguine seems to be able to sink through the physicality of earth or walls or prisons. It’s almost as if Landy tried to work just with Elementals like Skulduggery but didn’t have enough variety to play with. The most intriguing character for me currently is Stephanie’s reflection. It’s a device that my step-son would kill for: it brings her reflection out of the mirror to continue her mundane school life whilst she’s out detecting and magicking. And we’ve been told that she’s overusing it; she allows it to be shot and ‘die’ in her place; sorcerers are finding it difficult to tell it apart from the original; and it seems to be hiding things from Stephanie when it’s dismissed and she re-absorbs all of its/her memories. I can see Landy building her / it up as a plot device in future books. I still worry that there is a shallowness to the book: Stephanie barely blinks when the reflection ‘downloads’ the memory of dying into her own memories. She was equally unreactive to Gordon’s death in the first book. Again, it is another well paced story but perhaps sacrifices narrative for plot. I understand that there are limits to the introspection you can put into a Young Adult book… But I wanted some.